We arrive at New York Law School in the Tribeca neighborhood of Lower Manhattan which has been given a Hollywood makeover to resemble a police precinct for Paramount‘s sequel Teenage Mutant Ninja Turtles: Out of the Shadows. We’re here to witness something of a historical moment within the franchise, which is the first time a large group of humans are introduced to the humanoid turtles for the first time. They are a little more than halfway through with a four-to-five week shoot. With Earth to Echo helmer Dave Green taking over from the previous 2014 film’s Jonathan Liebesman, the new movie takes place six to eight months after movie one. Returning stars Megan Fox, Will Arnett and William Fichtner are joined by series newcomers Stephen Amell, Brian Tee, Tyler Perry, Brittany Ishibashi and Laura Linney. On set, the second unit shoots an action sequence in which the police department is filled with smoke and debris is falling from the ceiling as turtles (on the day merely actors in motion capture outfits) chase foot soldiers through the room. A pair of stunt turtles and stunt foot soldiers mill around in the background. Right before the take, the actor who plays Raphael, Alan Ritchson, is actually whistling the “Heroes in a Half Shell” theme from the original cartoon show, a good sign that these characters are surely in the right hands. In order to properly mo-cap the scene, turtle actors have painted dots on their face that makes them look like a poppy seed muffin. They also wear headsets with ping pong balls to show those acting opposite them where the actual eyeline is, as well as foam “turtle shells” on their backs. “Debris… turtles… running… jumping…” shouts the second unit director, actually line producer Dave Stewart acting as an AD. They’re shooting a clean plate with no debris or turtles for effects purposes. Then they shoot it with a girl holding a color chart with a big ball on a stick, one side mirrored and the other grey. Pablo Helman of ILM is supervising the effects. “This is some great s*** we’re getting,” Stewart shouts unenthusiastically. Featured police officers’ bodies line the floor after an explosion, and then extras are called in to take their place. They shoot a shot of Raphael (Ritchson) and Michelangelo (Noel Fisher) running with a cameraman pulled back in what looks like a rickshaw, holding the camera in his lap. It’s a surprisingly lo-fi method of getting a shot for a splashy Michael Bay production. B and C cameras also shoot from the back of the room. “Who didn’t love that shot?” Stewart asks after the rehearsal. We are then ushered into a side-room in the building where a make-shift video village has been set up for us by producer Andrew Form so he can introduce us to “Beebs,” a.k.a. Bebop (Gary Anthony Williams) and Rocksteady (Stephen “Sheamus” Farrelly). Form specifically wants to show us the bar scene where Bebop is funny in his close-up. The bar is 7B, a famous East Village joint that had previously been used in both The Verdict and The Godfather. In the scene, Bebop and Rocksteady are sitting at the bar–looking like something out of an ’80s movie–when Shredder walks in with foot soldiers and starts an argument of sorts. “Hey, you need to respect us! You heard of us already,” yells Rocksteady. “How about your own piece of the underworld?” Shredder replies. We are then shown a montage of footage including Tyler Perry as Baxter Stockman, as well as the outside of his lab called TCI. He pulls up in a fancy black sports car and walks through traffic, which was apparently not controlled by the shoot, so it was just Perry walking through traffic! We also see a shot of Megan Fox as April O’Neil in a blonde wig talking on an ear mic, as well as Will Arnett’s Vern Fenwick by the famous carousel in the Dumbo area of Brooklyn. Apparently to hide the Turtles’ identities, Vern has taken credit for saving New York in the previous film and is now reaping the spoils. Finally, we see a shot every Turtle fan has been waiting for: Casey Jones (Stephen Amell) emerging out of a fog-shrouded alley wearing his signature hockey mask. The monitors are then switched to the live feed from the cameras, where foot soldiers in all-black costumes take spinning leaps over Casey and April’s stand-ins. 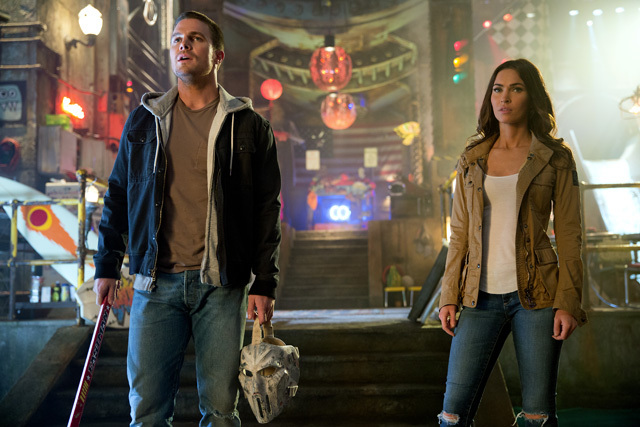 Form shows Megan Fox the footage of the stand-ins and she asks him why she and Amell have to do it. “Because you’re gonna turn,” Form replies. “We have to have that in the movie, why not shoot it?” Megan agrees, seeming very game. We see the actual actors get leapt over several times, which goes off without a hitch. 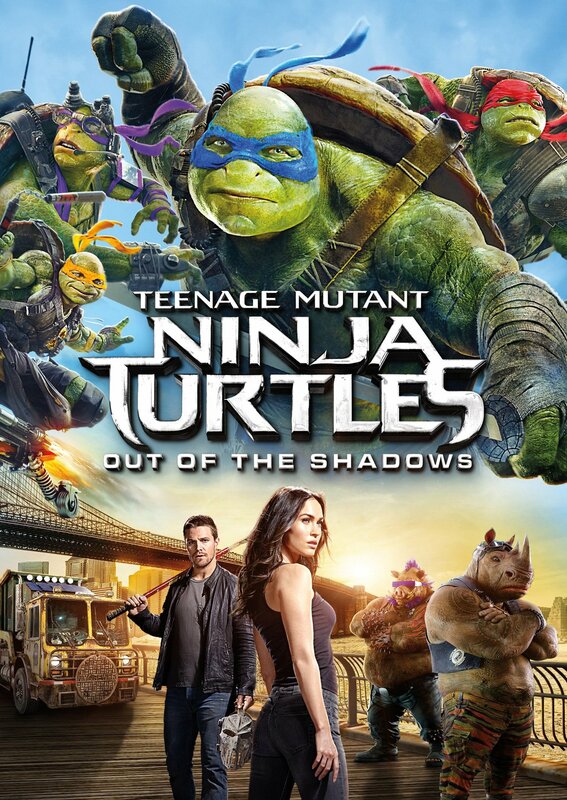 Teenage Mutant Ninja Turtles: Out of the Shadows will be released by Paramount Pictures on June 3, 2016.